At Southway Fency Company, our experienced technicians install and service a variety of automatic gates for everything from residential to commercial and industrial use. Whether you're seeking a decorative ornamental gate for your home or a high security gate system for your business, we can customize a design to meet your needs. Our automatic gates are available in a variety of options, including swing, slide and lift operated gates along with a variety of entry options such as telephone access, card readers and remote controls. We carry electric, hydraulic and solar powered systems. Schedule your Free On-Site Estimate for an automatic gate system today and speak with one of our representatives. We carry an extensive inventory of gate operator parts and accessories to provide you with seamless quick repairs. Call 330-477-5251 for emergency fence repairs. After 5 p.m., please call 330-323-2286. Southway Fence Company installs residential automated gate systems that provide security and protection for homeowners who wish to control access to their property. We install a variety of high-quality automated gate systems that provide durability and reliability for you to control access and security of your commercial business. 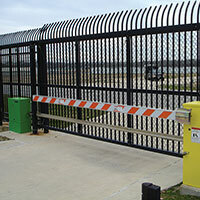 At Southway Fence Company, we provide and install high-security automated gate systems that feature high strength and durability to keep your industrial facility safe and secure.